Regardless of the cause, American University students established and carried out entertaining fundraisers. 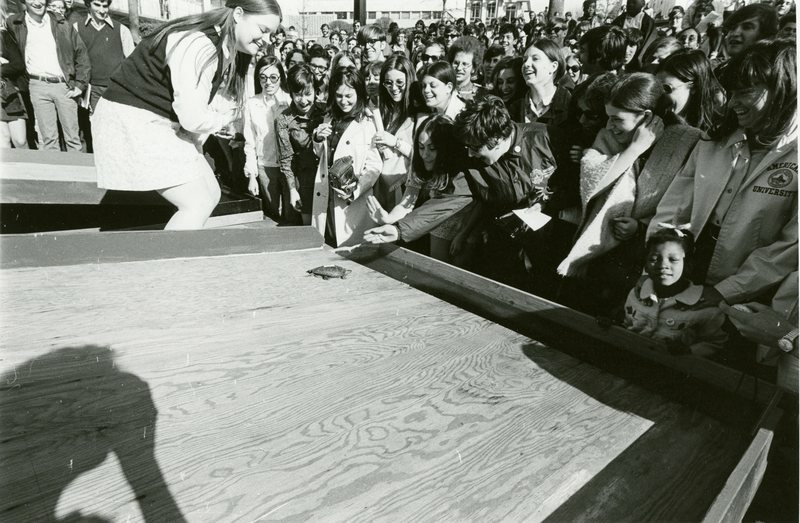 The Turtle Invitational, which began in 1964, became an annual tradition for students between 1970 and 1975. Turtles would race down the wooden ramp, competing with other turtle contestants, to reach the trough of water first. As an international race, the 1970 event included participants from Australia, England, and Canada. Art Buchwald, humorist, participated in the event as the race announcer and an honorary judge. Bob Mathias, a Congressman from California, served as the honorary race director. The Turtle Invitational raised money for the Muscular Dystrophy Association and the Cystic Fibrosis Fund. In later years, other fundraising events included an annual dance marathon to raise money for the Muscular Dystrophy Association. AU sponsored its 4th Annual Dance Marathon in 1982. For over nine years, American University hosted the American Classic 5K to support Habitat for Humanity.